Dan Ashworth will start his new role as the Football Association's director of elite development on Monday after receiving permission to leave West Bromwich Albion early. The FA announced in September that 41-year-old Ashworth had been appointed. He was expected to remain Albion's sporting and technical director until the summer. But Baggies chairman Jeremy Peace said: "Dan has worked tirelessly for nine years and leaves with our best wishes." He added: "He has remained fully committed to his club responsibilities since it was announced last September he would be leaving, for which I would like to thank him." Richard Garlick, Ashworth's replacement as Albion's sporting and technical director, was appointed in January. Ashworth will be available on a one-day-a-week consultancy basis for Albion until the summer. Peace added: "The handover process with Richard has gone extremely well, which has enabled us to agree to an early departure date with the FA for Dan. "We now look forward to Richard building on the solid foundations laid by Dan." Ashworth, who will be based at the National Football Centre at St George's Park in Burton, will work with director of football development Sir Trevor Brooking. He will be involved with developing the country's elite talent but not working specifically with the England senior or Under-21 teams. "As with any football-related job, there have been some lows [at West Brom] but we have managed to bounce back from them all and there have undoubtedly been far more highs," said Ashworth. "With the January transfer window now closed, the team having already amassed 40 points and Richard very much hands on in his new role, we all agreed this would be an appropriate time for me to move on. "But I will continue to help the club in any way possible in my consultancy capacity." 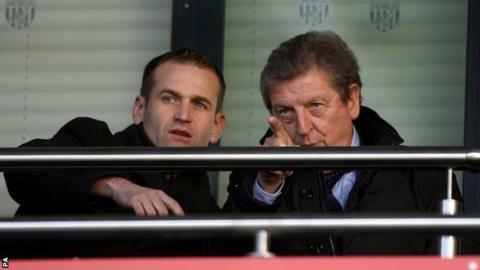 Key signing for Roy Hodgson's England?